Steven Spielberg’s celebrated Schindler’s List, his comeback film of sorts, seemed to validate the already successful filmmaker with his first Oscar. Its massive success, universal acclaim and mondo awards, 20 years on, as usual, results in increased scrutiny and re-examination. It’s never enough to let go of a massive success without reinspection periodically for cracks and flaws. Schindler’s remarkably survives the ravages time, for the most part the best parts of Spielberg represented and though some of the worst parts rear their head occasionally, it remains a unique cinematic experience. Oskar Schindler is constructed to be a classic Spielbergian hero, a man first characterized as a scheming unscrupulous businessman who cozies up to the Nazi elite in order to make his manufacturing business a success. His trajectory is dramatic, perhaps overly engineered as Schindler, by the end, turns into a rightheous philanthropist literally buying Jews from their fate in Hitler’s ‘final solution.’ I wouldn’t ever presume this happened as is in the real life, as it works perfectly for cinema. Too perfectly perhaps? Turning one of history’s most egregious tragedies into cinematic structure 101? Michael Haneke, who famously derided Spielberg for creating artificial suspense from the climatic shower sequence wherein the detoured female workers from Schindler’s camp are forced to endure the agonizing gas chamber procedure we learned of earlier in the film, would agree. I never saw any irresponsibilty with this moment nor Schindler’s character construction as flawed or reluctant hero turned heroic selfless champion. But from the mouth of Haneke, I can’t help but admire his opinion. This is the idea of the need to re-examine cinema periodically. Even with Haneke’s point taken Schindler’s List is a riveting piece of cinema. Three hours never went by so fast. Michael Kahn’s editing in particular shines. Spielberg and Kahn refuse to let the spectacle overshadow the smaller moments. As mentioned the introduction of Schindler is inspired, a series of quick close-ups, composed and cut with absolute precision. Through the entire nightclub scene we can’t help be reminded of Scorsese/Schoonmaker’s distinct rhythms, the high contrast photography, expressive use of popping flashbulbs, the punchy jump cuts and the very unSpielberg-like flash freeze frame seem to be cut right out of Raging Bull. Kahn channels some of sharp and abrupt editing of David Lean’s late career epics, cutting from a cigarette burning to the smoke from a steam engine. The introduction to the Krakow ghetto, the placement of the reception desk with all the appropriate documentation tools placed on the desk, then a remarkable cut from the precision of the administrator’s set-up to the chaotic mayhem of the Polish Jews being evicted from their home foreshadows the methodical and mathematrical nature of the Nazi’s extermination. At the time much was made of the disappearance of the Spielberg style within the reality of the story. Looking closely Spielberg’s familiar compositions are all over the film, though his may be handheld and less formal and locked down than his other films, Spielberg plays with all corners of the frame showing dynamic blocking and camera movement to manipulate the pace. The film is not without a few missteps in tone. During the liquidation of the ghetto sequence, the little boy who guides the bespectacled little girl and her mother to safety is overly sympathetic and wrought, and much of latter moments, including Schindler’s breakdown on the railroad and John Williams’ ultra-sad score in the end push drama into melodrama. And to the final conversation in the film wherein Stern and the others left by Schindler ask the Russian liberator, ‘Where should we go’, seems an unnecessary nod to the Zionist movement and the creation of Israel. 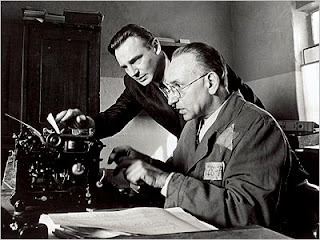 Is Schindler’s List the last word on the Holocaust in cinema. No. But it’s one the most passionate dramatic films ever made on thesubject, from a cinema master with his distinct point of view. There’s nothing more we could asked from Spielberg from this film.